Support the contributions of the GBLT community to the western life and sport of rodeo. The Gay & Lesbian Rodeo Heritage Foundation TM ("The Foundation") was established to support the lesbian, gay, bisexual, transgender and questioning (LGBTQ) rodeo community through education and preservation of the history and legacy of LGBTQ western life and sport of rodeo. The Foundation addresses a need which cannot be filled by existing rodeo associations due to their local focus and limited resources. Local rodeo associations are busy producing events and providing venues of competition for communities but lack the charitable resources to undertake a national outreach to gay youth and their allies to promote, encourage, replace and preserve the contributions of the LGBTQ community to the sport of rodeo event or to address the needs of the gay rodeo community outside their localities. The Foundation will promote and preserve the history and contribution of LGBTQ rodeo community. With fundraising as one of its major goals, donations will be available to foster the LGBTQ western lifestyle through outreach, scholarships, education, preservation and restoration. The Gay & Lesbian Rodeo Heritage Foundation is pleased to announce grant funds available to the western/rodeo/equestrian community , as capacity building grants, in the sum of $100-$500. The funds may be used to enhance or improve programs that are already partially funded. Enhancements may improve targeted outreach to LGBTQ underserved populations. The funds may be used to improve the quality, accessibility or viability of a rodeo school, as an example, that targets the LGBTQ community or other events as determined by the grantee. A broad base of board members, willing to serve and expand the mission of the organization. The Foundation has received its 501(c)(3) determination letter from the US Internal Revenue Service. We are now able to accept tax deductible donations from individuals, groups and corporations. 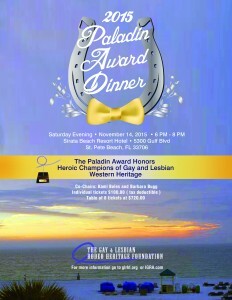 The Gay & Lesbian Rodeo Heritage FoundationTM was established in 2009 as a charitable foundation to support the broader community in preserving, maintaining promoting and communicating the role of the LGBTQ community in the sport of rodeo. The LGBTQ community has a long history in western lifestyle and philanthropy dating back to 1976 when the very first "Gay Rodeo" was held at the Washoe County Fairgrounds in Nevada. By 1980, gay rodeo had gained a great foothold in America and literally thousands attended the Reno rodeo as participants and observers, raising $40,000 for the Muscular Dystrophy Association. The Foundation was established after a chance meeting with the Autry Museum, who expressed an interest in the history of the LGBTQ community, as a silent presence in the rodeo world. This meeting led to the 25 year old archives of gay rodeo being moving from the dark basement of a gay bar in Denver, to the bright lights of public display at the Autry Museum. Still, so much history, memorabilia and contributors have been lost. The first organizational Board meeting was held in Toronto, Canada on November 11, 2009. In April 2010 the GLRHF received a tax deductible letter of Determination from the IRS as a 501(c)(3) Charitable Organization.